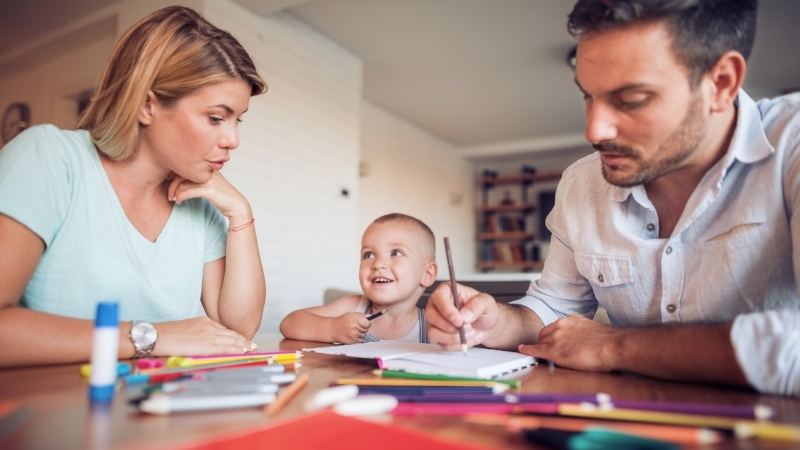 A new Government drive urging parents to claim child benefit to avoid losing state pension has prompted a call to fix the current 'administrative mess'. An official alert telling parents they 'may inadvertently be missing out on retirement income' is missing the point, according to one mum who has already lost four years of credits towards her state pension. Emma Maslin, 37, who could be nearly £20,000 out of pocket if she lives for 20 years after retirement, is among thousands of parents potentially facing a poorer old age in a scandal recently highlighted by This is Money. Parents who do not register for child benefit, because one of them earns more than the £60,000 annual threshold above which it is clawed back, are at risk of losing valuable state pension credits for looking after children rather than working. Instead the Government expects them to register but not take the child benefit payments. Maslin claims the Government should 'do the right thing' and give parents their missing state pension credits back, while also overhauling the current system to prevent more people falling into the same trap. Former Pensions Minister Steve Webb has also renewed his plea to the Government to fully relax the backdating rules so that parents who belatedly claim child benefit can get back all their lost credits towards a state pension. At present, you can only get three months' worth of credits backdated. The new Government warning, issued by Secretary of State for Work and Pensions Esther McVey, urges parents with children under 12 to ensure they receive valuable National Insurance credits by submitting a child benefit claim, even if they don't qualify for these payments. 'Don’t miss out on potentially increased pay-outs from your future state pension. The state pension is a foundation for retirement,' says McVey. Read more on the Government's alert to parents below. Maslin says: 'I feel the Department for Work and Pensions are missing a crucial point here - WHY are people missing out? 'Credits are available to all who have a child under 12 and yet there is a need to actively opt in to receive them. 'There are surely far easier ways to ensure parents are registered than the current system which is seeing thousands of eligible parents missing out. Maslin, who has tried to warn other parents on her Money Whisperer blog, also called for full backdating of state pension credits for those who try to correct the record at a later stage, the way she did. 'I think it is extremely poor that those who do sign up but only when their children are older still only receive three months of backdated credits. Why is it so important to claim child benefit? Those who sign up get valuable credits towards their eventual state pension, providing they are not working and building up their National Insurance record that way. Each credit missed could cost you 1/35 of the value of the state pension – around £244 per year or £4,880 over the course of a typical 20 year retirement. Four years lost works out at £19,520. It's crucial a parent who is not working is the one named on the form to get the child benefit, as these credits are worthless to someone employed and already paying enough NI. You can apply to transfer it later, but couples report being refused this option for reasons they don't understand and HMRC has so far failed to explain. Meanwhile, new parents - predominantly women - who fail to sign up because they don't qualify for the payments can end up losing many years' worth of credits they can't get back. This is because if they discover their mistake and belatedly sign up, HMRC will only backdate their records for three months. Steve Webb, now policy director at Royal London, says it is good that the Government is highlighting the value of National Insurance credits towards the state pension, but instead of one-off initiatives it should proactively target people using its lists of those who might be affected. 'In some cases the Government knows with some precision the exact people who are missing out on these NI credits and it should be contacting them personally and directly. 'For example, the new mothers who have not claimed child benefit will have registered the birth of their child. 'The Government could easily compare the birth register with the child benefit register and contact the families who are missing out. This would have a much bigger impact than generalised publicity, however well-intentioned. Nicky Morgan MP, chair of the House of Commons' Treasury Committee, has also expressed worries and pushed the Government and HMRC to look into the issue of parents losing state pensionfollowing changes made in 2013. The controversial overhaul reduced the entitlement for those earning £50,000-plus a year or wiped it out entirely for those earning £60,000-plus. But parents who earn too much to qualify for child benefit still have to apply for it so that they receive state pension credits. Those who failed to sign up when the new rules began could have lost six years of state pension credits by now. In response to the new Government awareness initiative, Morgan said: 'Treasury Committees, both past and present, have expressed concern about the impact of the High Income Child Benefit Charge on National Insurance credits, and people potentially forgoing part of their future state pension. A recent investigation by This is Money found that even parents who do manage to fill in child benefit forms may still miss out because they are so complicated it can be easy to make a mistake – and there is little forbearance for anyone who does. Couples tell us they are struggling to sort out old child benefit claims dating back 10 and even 20 years, but getting bogged down trying to convince the taxman to set things straight. They are being blocked from transferring state pension rights between them when the 'wrong' partner signs up for child benefit, and are in the dark about why HMRC has refused them. HMRC is accused of creating a 'shambles' by giving out incorrect information to parents and failing to explain its refusal of appeals to sort things out. Couples have come forward after reading This is Money columns by Steve Webb about people getting ensnared in 'nightmare' child benefit red tape. This year, he has highlighted problems faced by one woman who lost credits by mistakenly putting her husband's name first on the child benefit form, and another who like Emma Maslin failed to register because she wasn't eligible for the payments. Meanwhile, it is feared many grandparents taking on childcare duties could also be unwittingly losing credits towards a state pension. But unlike with parents applying late for child benefit, who only get credits backdated by three months, the Government lets grandparents claim transfers for years all the way back to 6 April 2011. The recipient must still be of working age, but otherwise the process involves the parent filling in and submitting a form. HMRC has changed child benefit forms to say claiming 'can help to protect your state pension' - but not that you risk losing thousands of pounds in old age if the wrong parent fills in the application, or you omit to claim because you don't qualify for payouts. Forms are handed out in 'Bounty Packs' in hospitals after births, but parents say these come filled with money-off flyers and promotions and it's not clear they also contain important documents. HMRC stresses the importance of parents making a claim for child benefit to protect their state pension, whether or not they are eligible receive the payments. 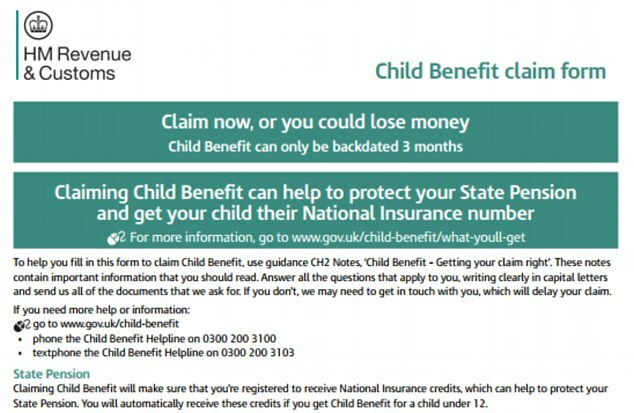 Customers can find specific information on the child benefit claim form, through the HMRC helpline, online at gov.uk, through partners such as Citizen’s Advice, and in the Bounty packs that go to new parents, it says. HMRC adds that it continuously reviews its communications to ensure that the right information is available.